Ex-Chairman, Odu’a Investment Company Limited, Barrister Sharafadeen Alli; ex-Vice Chairman, Senate Committee on National Planning, Economic Affairs and Poverty Alleviation, Senator Olufemi Lanlehin and Social Democratic Party (SDP) candidate in 2015 elections, Engineer Oluwaseyi Makinde who are the top 3 governorship aspirants under the Peoples Democratic Party (PDP) in Oyo State for 2019 governorship elections have started scrambling for the soul of the state, DAILY POST exclusively reports. Investigations by DAILY POST has it that the formation of the caretaker committee of the party headed by Hon. Tunde Akogun which culminated into elections into wards, local and state executives of the party in November 2017 shown that the trio of Alli, Lanlehin and Makinde are the talks of stakeholders, party stalwarts, elders and members within and outside the party. 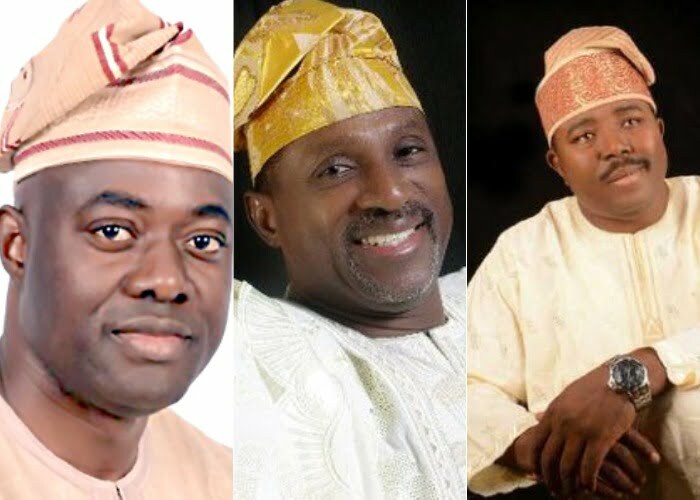 The three politicians whose body language have shown to be the most serious in their bid to occupy Agodi Government House from May 2019, are all from Ibadan, the state capital. Alli is from Oke-Aremo in Ibadan North Local Government. He was the only elected Chairman under the platform of the defunct National Republican Convention (NRC) during the aborted third republic in the state. He served as Secretary to the state government when Senator Rasidi Adewolu Ladoja was the governor. Lanlehin who served as Oyo State Coordinator for ex-President Olusegun Obasanjo and Abubakar Atiku second term campaign committee is from Inanlende, Ward 2 in Ibadan North West Local Government. He represented Oyo South under the platform of the defunct Action Congress of Nigeria (ACN) from 2011 to 2015 and had served as Special Adviser to ex-Lagos State governor, Senator Bola Tinubu on Local Government and Chieftaincy Matters. Makinde, who was the Oyo South Senatorial candidate for defunct All Nigeria Peoples Party (ANPP) on the other hand, hailed from Ibadan North East Local Government. The trio, DAILY POST recalls were also members of the caretaker committee representing their various local government areas under the Tunde Akogun led caretaker committee. Alli whom many believed is the most experienced politician among the trio served as member of the committee representing Ibadan North Local Government. Lanlehin served as member from Ibadan North West while Makinde represented Ibadan North East Local Government Area in the committee. The trio based on investigations by DAILY POST in the five geo-political zones of the state; Ibadan, Ibarapa, Ogbomoso, Oke-Ogun and Oyo have started running after politicians, party men and women and various interest groups including youths and socio-cultural organisations in ensuring that they clinch the ticket of the umbrella party and eventually emerge as next governor of the state. A source informed DAILY POST that Alli has in the last couple of months started grassroots mobilisation and sensitization through one on one meeting with stakeholders, media and the use of social media. Lanlehin on the other hand is not left out in the use of what he considered as campaign tools in reaching people of the state. Makinde, it was learnt has also started the battle ahead of 2019 elections. Makinde after losing the 2015 elections did not go under as he ensure that his Omi Tuntun structure in the 33 local government areas of the state was intact before and after he finally returned to PDP. A reliable source within the party while speaking with DAILY POST maintained that though there are other aspirants jostling for the ticket, it is expected that for the party to get it right in the next general elections, it must find ways of presenting one among the trio. A close ally of Alli told DAILY POST on Tuesday that the ex-Chairman of Odu’a Investment Company Limited had a better chance than other aspirants considering his antecedents. He said “Sharafadeen stands a very height chance to clinch the PDP ticket, even by his political antecedents he has it than any other person. “Don’t forget he was former Chairman, SSG, Chief of Staff, former Chairman Oodua conglomerate. “The idea of imported candidate is no more, infact he is more local and very social that know what is going on the world. You need to give it to him especially when you are talking about administration and experience,someone who can manage material thing and human being perfectly”. A follower of Lanlehin who also spoke with DAILY POST in confidence informed that Lanlehin is no doubt an aspirant to beat in PDP. He said, “He is a grassroots politician, he has worked with most three powerful politicians in South West, as SA to Tinubu on LG and Chieftaincy matter, Coordinator, Obasanjo Atiku Presidential campaign, also with Adedibu which earned him the position of Chairman, Board of Ogun Osun River Basin under Obasanjo and Chairman, Board of LAUTECH during Akala eleven months reign. “During his position as Chairman Ogun Osun, he provided portable bore holes powered with solar energy across the catchment of the board. “As Senator he provided bore hole power by solar energy, transformer and empowerment to his senatorial district Ogun-Oshun River Basin Development Authority”. One of the close Aides to Makinde, when asked on the chances of his boss on Monday described him (Makinde) as the strongest contender in the party. He said, “The way the party is presently constituted from ward level to Local government and State level. There is no single soul or group who has the total or biggest stake or control of the party among the political juggernauts in the state. “The party is gradually returning to the people as its slogan says ‘power to the people’. The most popular among the strongest contenders in the party and beyond today is arguably Engr Seyi Makinde. “The party at the National level has learnt their lessons with the disgraceful outing in the last gubernatorial election occasioned by imposition of unpopular candidate hence the national leaders of the party have resolved to provide level playing field to the contenders. The Seyi Makinde’ s popularity and Goodwill among electorate is equal to non among other contenders in the party in Oyo state. “He has a soaring affection among the youth and downtrodden with his Various empowerment programs and communities development projects which include Bursary awards and Scholarship, provision of Pipeborne water, provision of Electricity to rural and urban communities across the state, provision of non-higher price cab for taxi drivers, weekly empowerment of widows and aged. To mention a few. “He is regarded as philanthropist of note that is equal to non among politicians in the state because he remains the only politician who has not been elected or appointed into political office but yet he remains biggest donor in all spheres to salvage people from grinding poverty. “The strength of Engineer Seyi Makinde lies with his strong connection With the people/ Electorate who are desirous of new face that they can easily identify with and they strongly believe he has it requires in terms of exposure, Education, international contacts that could bring international investors and industry to stem the growth of unemployment that has reached it ugly head in the state”.